On the latest Wuxia Workshop, Joel and I talk about the movie The Brave Archer and how to apply it to an RPG. For those who don't know, the Brave Archer series is Chang Cheh's retelling of the classic wuxia novel Legend of Condor Heroes (AKA Eagle Shooting Heroes). 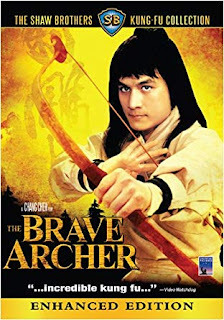 Brave Archer follows the adventures of the heroic couple Guo Jing and Huang Rong. The former is simple but virtuous, the latter intelligent and resourceful. Together they get drawn into a conflict with a Jin prince and explore the colorful landscapes of Louis Cha's martial world. The first film cultivates with a contest on Peach Blossom island, where Guo Jing must compete with the nephew of a terrifying villain to marry Rong. We discuss the movie, and we talk about the kinds of inspiration it offers. One of the most important things about Brave Archer (and the original source material) is its endlessly inventive characters. It provides a good example of the kinds of people player characters might meet in a campaign, and demonstrates well their role in the transmission of martial arts. It also provides solid material in the form of manuals. The Nine Yin Manual for instance, creates a lot in the way of conflict and challenge for the characters. One of the villains in the film, Mei Chaofeng, uses the ferocious Nine Yin White Bone Claw technique from a version of the manual that she and her husband stole from Peach Blossom Island. The film also is a good example of romance done in a way that fits well into an RPG. Other topics include Martial Contests, allies & enemies, and the role of wandering masters.